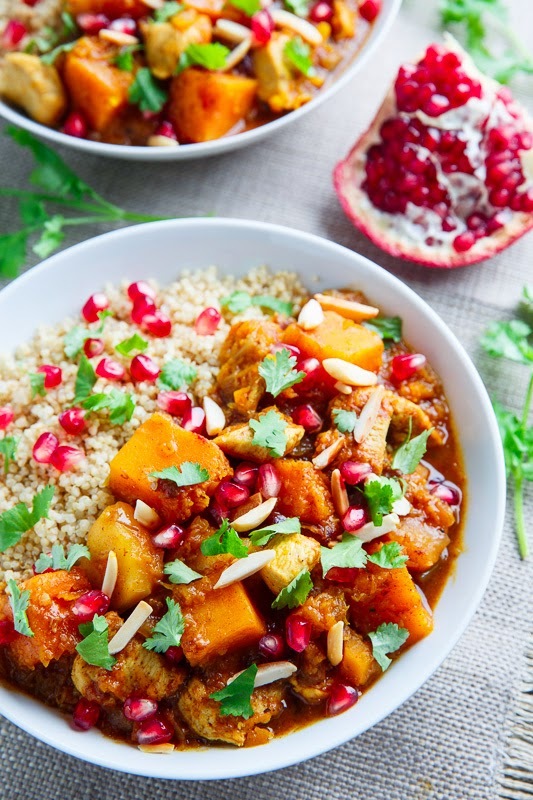 A pumpkin and chicken tagine (a Moroccan style stew) that is just packed with fall flavours! 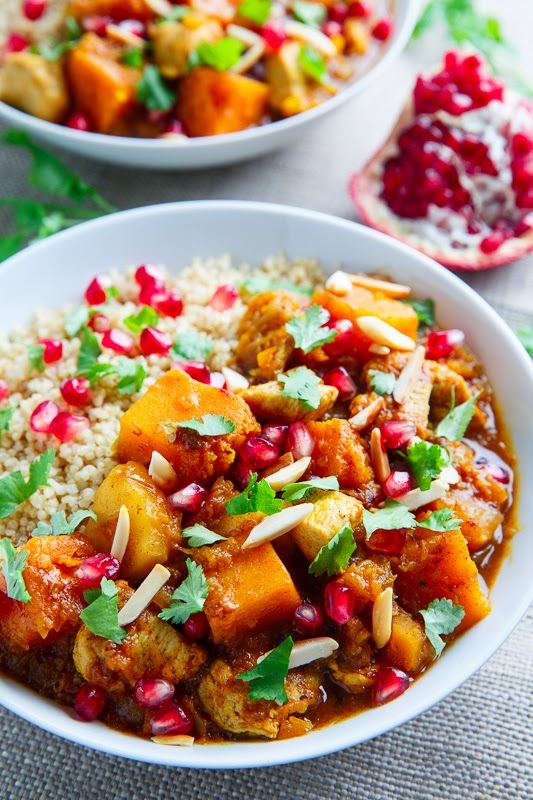 I certainly have been enjoying pumpkin season and while they are here I squeezed in another recipe, this pumpkin and chicken tagine (a Moroccan style stew). One of the signatures of a tagine dish is all of the multitude of flavours that meld together perfectly and these flavours come from the use of many spices and other ingredients; but don’t let the long list of ingredients daunt you, it’s actually a really easy dish to make and well worth it! I was going for a Fall theme with stew so I added some apples to the pumpkin and they complement the pumpkin nicely without overpowering it. There are usually plenty of spices in a tagine and they vary from dish to dish and for this one I went with more of a pumpkin pie spice blend with cinnamon, ginger and cloves. Tagines also commonly include dried fruit such as raisins, apricots, etc and for this fall themed tagine I went with dried cranberries. The final touch of fall comes from the pomegranate garnish which accompanies the almonds, cilantro and yogurt. 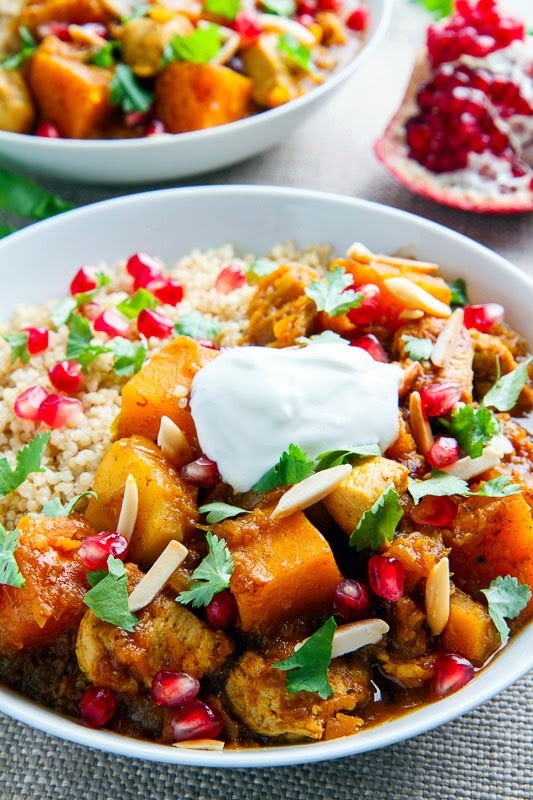 This pumpkin and chicken tagine truly does taste like a wonderful melody of fall in your mouth and it is perfect comfort food for these cooling days! Top with some yogurt and you are ready to go! Heat the oil in a large saucepan or tagine over medium-high heat, add the chicken and cook until lightly browned on all sides before setting aside. Add the garlic, ginger, turmeric, cinnamon, ginger, cloves, and cayenne pepper and saute until fragrant, about a minute. Add the broth, chicken, pumpkin, apple, harisa, honey, cranberries, preserved lemon, saffron threads, salt and pepper, bring to a boil, reduce the head and simmer until the pumpkin is tender, about 20 minutes. Serve over cous cous or rice or quinoa, etc. topped with the almonds, cilantro and yogurt. Option: For One-Pan: Make this a one-pan meal by adding 1 cup of rice and 2 cups broth or water (or 8 ounces of pasta and 2 1/4 cups broth or water) to the sauce in step 8 and simmer, covered, until cooked, about 20 minutes (or 12 minutes for pasta). Option: Use skin on and bone in chicken thighs, legs or drumstick instead of the skinless and boneless chicken breasts or thighs. Sear the skins in the pan until browned and then increase the cook time to 30 minutes. Option: Replace the chicken with 2 (15 ounce) cans of chickpeas for vegetarian version. Option: Replace the pumpkin with another sweet winter squash like a butternut squash or kobacha, etc. What a great savory pumpkin recipe! Totally different than the pumpkin recipes I usually see! Perfect Fall recipe! Love this! Absolutely gorgeous! I would eta the whole.e recipe up! This is so pretty! I would LOVE this on my dinner table! Kevin, you've outdone yourself here with this one. . the perfect fall dish with pumpkin and chicken and love love love the pomegranate garnish and cranberries!! wow!! love this and pinned!!! so vibrant and I can taste the flavors from here! I can't get over how pretty this is!!! WOW! What a fabulous fall recipe! Looks delicious and I am definitely going to try this! What's not to love about this? The photos are SO vibrant and colorful! This sounds like an amazing twist on tagine! I am picturing eating it right now and it sounds so delicious. How would you cook this in a Tagine Pot? Keep this pumpkin train a 'rollin'!! This looks heavenly!! I own a tagine; this recipe is called Chicken Tagine, but doesn't use one? Can it be adapted? Cindy Skinner: You can just use your tagine instead of the sauce pan! Just made this and the sauce is wonderfully tasty! Will have this with quinoa. Is the preserved lemon the one in brine and is it only the rind to be used? Thanks so much for the recipe! KLo: I'm glad you enjoyed it! Only the rind of the preserved lemon is used.